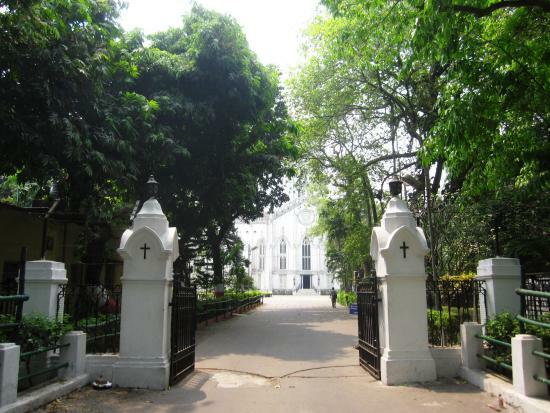 St. Paul’s Cathedral, the first Episcopal Church in Asia, and the first cathedral built in the overseas territory of the British Empire, was basically built to substitute St. John’s Church, which had become too small for Calcutta’s growing European community in the 1800s. The area that was allocated for the construction of the new church was described as a wild forest and far too south of the European locality of the city. After acquisition of 7 acres of land, a Cathedral Committee was formed to build the structure. The military engineer, Major William Nairn Forbes, who later became a Major General of the Bengal Engineers, designed the cathedral, with the assistance of an architect, C.R.Robinson, in a Gothic architectural style, added with certain necessary provisions to meet the adverse climatic conditions of India. Modeling the tower and spire upon the Norwich Cathedral, the construction of the church started at the initiative of the benefaction of Bishop Daniel Wilson in 1839 and was finally consecrated on 8th October 1847. Unfortunately, the cathedral was severely damaged during the great earthquake of 12th June 1897, when the upper part of the steeple fell. However, that was restored at a later date. But it was completely destroyed in the massive earthquake of 1934. Its Gothic spire, modeled along the lines of the central tower of Britain’s Canterbury Cathedral, was added later, after the earlier steeples were destroyed. St. Paul’s Church is an architectural marvel. The massive structure is 247 feet long, 81 feet in width and 114 feet at the transept. The Flagstaff rises to a height of 175 feet above ground level. The cathedral’s tower is modeled on the Bell Harry tower of Canterbury Cathedral. On completion, the structure looked like England’s Norwich Cathedral, complete with three Gothic stained glass windows and two frescoes in the Florentine Renaissance style. The eastern wall in the cathedral has paintings of the life of St. Paul, painted by Blomfield in 1886. The cathedral is decorated with a dignified organ, with 41 stops. Made by the famous Joseph Willis and Sons of London, the organ is still in use. The main hall of the cathedral is equipped with beautifully carved wooden church chairs and benches. The tower, on which the 221 feet high central spire stands, is square in shape and is almost looks like a replica of the 12th-century Canterbury Cathedral, England. The tower was fitted with five huge clocks, each of which weighed about three tons. The vibrantly colourful stained glass windows on the western side were exquisitely created by Sir Edward Burne-Jones, known to be a famous Pre-Raphaelite painter. While the stained glass window on the eastern side was unfortunately destroyed by a terrific cyclone in 1964, it was replaced with a new one in 1968. The cathedral complex has a library on the western porch, which was built at the initiative of Bishop Wilson. The cathedral has a statue of Bishop Heber, the Second Bishop of Calcutta. 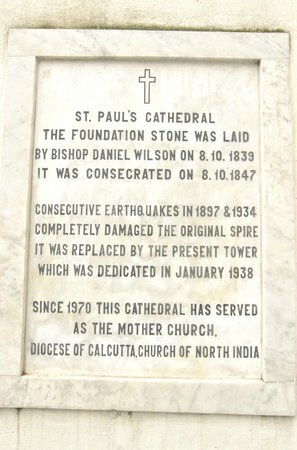 Apart from Bishop Daniel Wilson, who had requested burial here, the cathedral is also the final resting place of a few dignitaries of the period, including T.F.Middleton, the first Bishop of Calcutta.